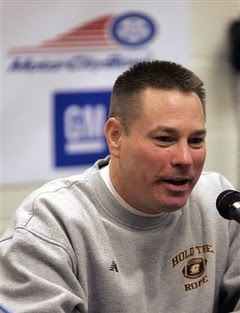 Bearcats Blog: Sources: Butch Jones is the new Cincinnati coach. The winds of change are blowing through the University of Cincinnati, and it appears they have brought another coach from Central Michigan. Sources everywhere from ESPN to the USA Today are saying that he is the man for the job. Can't say that I'm too surprised by this one. I gave him a 63% chance at taking the job, and after Chris Peterson, who was never going to come here, he was the man I wanted. The man that wasn't Turner Gill. But, more tomorrow if this is true.